Typhoon TEMBIN showed re-intensification this morning, but effect on Sakishima Islands will not increase from now, and the current situation indicates that strong winds and heavy rains are not the level causing extensive damages. On the other hand, Taiwan in the east and in the south will be affected by the typhoon from now, and part of the east is now within the gale wind area. The typhoon is still moving slowly, which may lead heavy rains that continue for a long period of time. 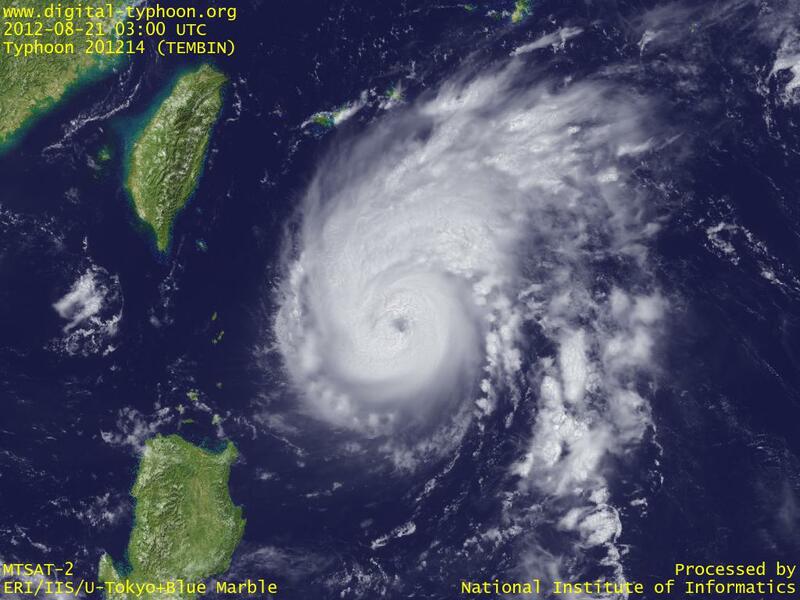 Typhoon TEMBIN has rapidly intensified last night, but today intensification has stopped for the moment. It however has very thick clouds around the center, so it is likely to intensify more with its eye being smaller. Effect on Sakishima Islands in Okinawa depends on how long the typhoon keeps its northward movement from now, and effect on Taiwan depends on how long it causes heavy rainfall by its relatively slow speed. Typhoon TEMBIN is rapidly intensfying while being almost stationary in east of Philippines. 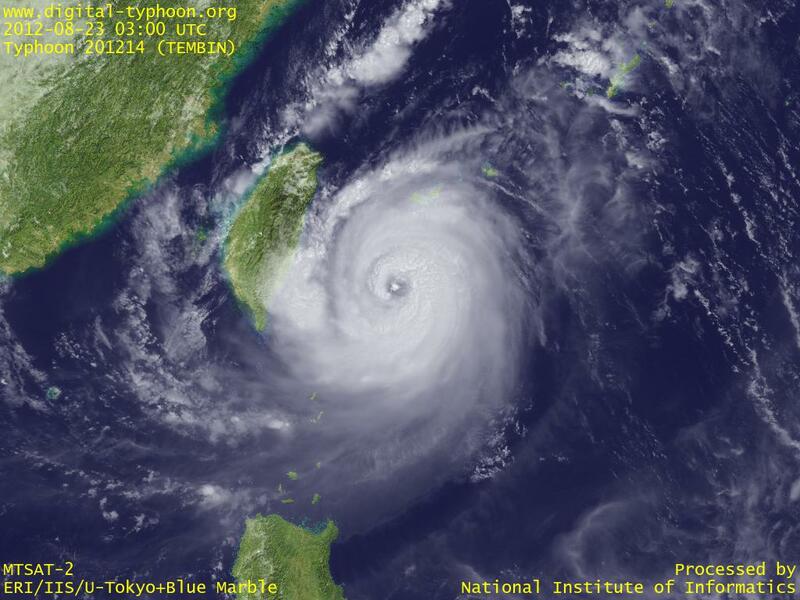 Satellite visible images show that this typhoon has been well-balanced since the beginning, and it formed an eye just in one day from its birth. This typhoon is expected to intensify more in the near future. 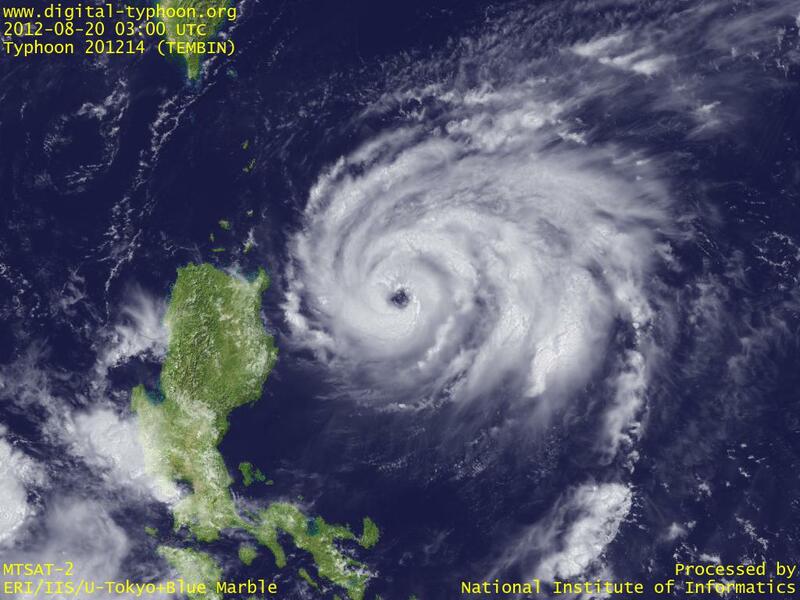 Typhoon TEMBIN was formed in east of Philippines. This typhoon is now moving southwest, but is forecast to turn north to draw near to Sakishima Islands of Okinawa.